Everyone knows getting in on the ground floor is key, unless, of course, they've just got one of those number pad things. 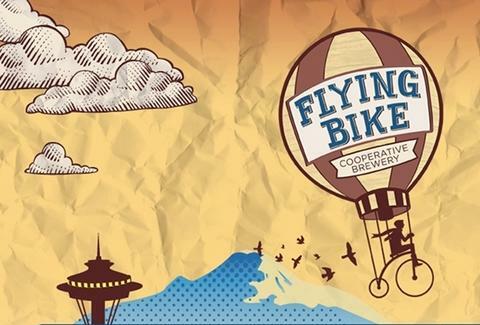 Now letting you get in on the ground floor with something that'll totally make you forget your door code anyway, Flying Bike Cooperative Brewery. Started by a software developer/home-brewer (with help from eight other founding members), FBC's planning to open the nation's second-ever community owned brewery/tap house that'll give people who respond to their just-launched membership drive a say on the spot's location, what suds'll get made, etc., and will operate under seven cooperative principles that include "democratic member control", which'll make things interesting when you hold an erection election. Purchasing a membership will give you one share in FBC (it'll operate on a "one share, one vote" basis) and lace you with rewards like annual patronage refunds, access to member-only events, swag, and brewery discounts; plus early members'll get special benefits as part of the "Thirsty 300", also a movie about a bunch of jacked dudes in small kilts who just tried to eat seven Saltines in under a minute. It's impossible!!! FBC's in the process of hiring a master brewer to craft a series of house beers and seasonal concoctions that'll be tested at member tastings before going on tap, and they'll hold several annual brewing competitions that'll give members a chance to have their own suds made by a pro, so it might finally be time to dust off that Bud Ice/Red Dog/Sriracha combo recipe. They're planning on throwing a launch party on May 14th, but the real fun won't come until the brewery opens in 2012; part of the wait is due to the Liquor Control Board, but also because even if they reach their goal of 2000 members, they'll still need to find additional investors, which may be the key to opening on time, or just a reason to pad their numbers. Who really knows?! ?